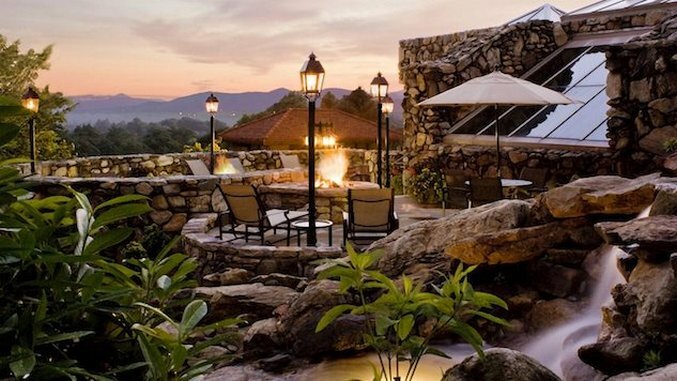 It was my first time visiting Asheville, and while I was familiar with the craft beer culture and artsy downtown scene, I didn’t know The Omni Grove Park Inn happened to be one of the best spots in town to catch the sunset. As valets whisked my luggage up to the room, I strolled through the Main Inn lobby past a couple swaying to the live jazz band playing near the door. I stepped out on to the Sunset Terrace as the sky shifted from shades of violet to pink, and the sun slowly dipped behind the Blue Ridge Mountains. At the hotel’s opening banquet in 1913, William Jennings Bryan, Secretary of State at the time, said the inn “was built for the ages.” Built in less than a year, it took 400 men working 10-hour shifts six days a week, using only mules, wagons and ropes to hoist granite boulders of up to 10,000 pounds up Sunset Mountain. Even now after a $25 million renovation, the hotel still exudes this timeless feel, from the regal lobby to the understated suites. It’s no wonder historic spots like The Omni Grove Park Inn and neighboring Biltmore have become destinations in themselves, making for the perfect escape this summer on a road trip across the U.S.
At The Omni Grove Park Inn, you can take part in everything from a round of golf at the Donald Ross-designed 18-hole championship golf course to foraging tours on the mountaintop or a day at the subterranean spa. The 43,000-square-foot spa is just as much of a landmark in the city as the hotel. Cave-like rock walls and tunnels frame 20 water features (which include mineral-based pools), and private nooks are scattered throughout, making for the perfect perch to lounge with a glass of Champagne in between spa sessions. Later that same weekend, I moved over to The Inn on Biltmore Estate, one of three spots to stay on the 8,000-acre property. George Vanderbilt, the grandson of philanthropist Cornelius Vanderbilt, looked to Asheville’s Blue Ridge Mountains as the locale for his country home. The 250-room French Renaissance “country home”—which spans four acres—ended up being one of the largest projects in residential architecture, taking six years to build. During the Depression, the Vanderbilt family opened the house up to the public in hopes of boosting tourism in the city. While the Inn was part of the initial plan, the hotel wasn’t built until 2001. Given the size of the estate, it would take more than a weekend to properly explore the grounds. For day visitors, the Biltmore House & Gardens are major highlights, but you can also set off through the estate by wagonette or horseback through the meadows and pastures. I started my stay at the pool, with sweeping views over the perfectly manicured gardens and rolling hills, before heading off on one of the walking trails crisscrossing around the property. Rooms at the Inn veer on the modern side, but the hotel still has that Old World air with elegant high tea service in the library and field-to-table cuisine served on fine china and crystal in the Dining Room. Even the working farm has been part of Biltmore since the estate got its start. You’ll find the estate-grown greens, berries, beef and lamb weaved into seasonal plates at the restaurant, such as the espresso-crusted lamb rack and risotto with wild mushrooms and English peas. Another European-style boutique hotel on par with a property like Biltmore lies in Newport, RI, along the Cliff Walk. The Chanler was designed by John Winthrop Chanler in 1870 as a private cottage summer home for the New York congressman and his family, where they entertained guests like poet Henry Wadsworth Longfellow and President Theodore Roosevelt over their five-decade stay. The house shifted hands operating as apartment housing for naval officers before catching fire in the 1940s, reopening as a hotel following World War II. In 2003, the property was refurbished and brought back to its original state, standing out as the only hotel among Cliff Walk’s infamous row of beachfront mansions. Villas here feature French doors and vistas overlooking Easton’s Beach, with an upper deck prime for taking in views of Cliff Walk and the water. Manor rooms, meanwhile, work in design elements from different decades and styles around the world, from Greek Revival to British colonial (think iron beds and antique pine floors). While the hotel itself is gorgeous, the best part is really once you step outside. Opt for one of the rooms with a direct path leading straight down to the 3.5-miles-long Cliff Walk, where you can take a morning stroll while admiring mansions-turned-museums like The Breakers, a former summer home of Cornelius Vanderbilt II.